4-Word Review: Clint and Burt together. 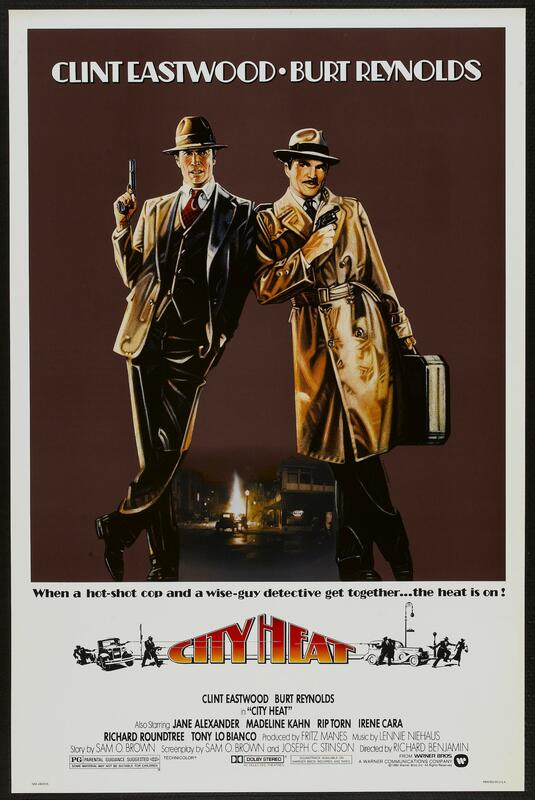 Mike Murphy (Burt Reynolds) is a private eye living in 1930’s Kansas City who at one time worked as a cop. When his friend Dehl (Richard Roundtree) gets murdered after obtaining the secret accounting records of a local mobster and then trying to blackmail him with it Mike goes on a mission to find the culprit, but soon finds himself in over his head. His former police partner Speer (Clint Eastwood) gets involved and the two reluctantly work together to solve the case despite the many clashes with their personalities and methods. The script was written by Blake Edwards who gets credited under the pseudonym Sam O. Brown. He was originally slated to direct, but Burt didn’t want to work with Edward’s wife Julie Andrews who was cast in the role that later went to Madeline Kahn because the two had clashed just a year earlier while starring in The Man Who Loved Woman. Clint desired a less intense director at the helm, so the two used their star status to have Edwards yanked from the project and replaced with actor-turned-director Richard Benjamin. The result is a strange mish-mash of a movie that at times seems like a pedestrian action flick and at other moments becomes a campy comedy. The film starts off well. I enjoyed the fight Reynolds with has with two men inside a café while Eastwood sits back and does nothing, but things deteriorate quickly after that. Part of the problem is Eastwood and Reynolds are only funny when they are seen together and working off of each other’s contrasting styles. Alone there are boring at least here with Eastwood playing too much of a caricature of himself while Reynolds is unconvincing as a tough guy. The film would’ve worked much better had the two been partners from the very beginning instead of throwing in this contrived bitterness between the two, which is never funny or interesting. Outside of Rip Torn’s performance as a rival gang boss the supporting cast is wasted especially Jane Alexander in a thankless throwaway role as Reynold’s secretary. Kahn manages to have some redeeming moments when she gets kidnapped by the mob and then beats her captors at poker, but it is not enough. Irene Cara sings a few good tunes, but proves to be weak as an actress. The shootouts are great and the best thing in the movie as unlike the rest of the film they manage to have a nice balance between being exciting and funny. Unfortunately the plot itself is overblown, confusing and formulaic and a prime example of a Hollywood production relying too much on the charisma of its two stars while failing to supply them with material that is fresh or original. This entry was posted in 80's Movies, Action/Adventure, Buddy Movies, Comedy/Drama, Gangster Movies and tagged Blake Edwards, Burt Reynolds, Clint Eastwood, Entertainment, Irene Cara, Jane Alexander, Madeline Kahn, Movies, Review, Rip Torn. Bookmark the permalink.